Stock photo of Toronto's skyline against a clear, cloudy, and blue sky with CN Tower and Toronto Islands Ferry in the City of Toronto, Ontario, Canada. 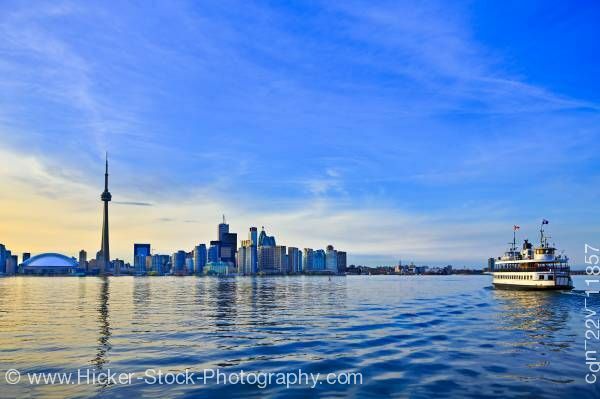 This stock photo includes the city of Toronto's skyline as seen from water level far out on Lake Ontario, with the CN Tower and the Toronto Islands Ferry also in this scene in the City of Toronto, Ontario, Canada. The city is intersected by two rivers and numerous tributaries: the Humber River in the west end and the Don River east of downtown at opposite ends of the Toronto Harbour. The harbour was naturally created by sediment build-up from lake currents that created the Toronto Islands. The many creeks and rivers cutting from north toward the lake created large tracts of densely forested ravines, and provide ideal sites for parks and recreational trails. However, the ravines also interfere with the city's grid plan, and this results in major thoroughfares such as Finch Avenue, Leslie Street, Lawrence Avenue, and St. Clair Avenue terminating on one side of ravines and continuing on the other side. Other thoroughfares such as the Prince Edward Viaduct are required to span above the ravines.